The island of Favignana combines stories and beauty, this is why it’s loved by all the tourists who visit it. 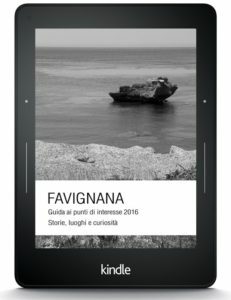 In this ebook (also available as a paperbook) are collected the main stories of the island and the places that make it fascinating: the places of interest to visit and discover not only the beaches and places to swim, but also the stories and curiosities that made it so special through the centuries. Florio’s epic, fisheries and tuna industry stories, the stories of the two Castles (which were three), prisons, prisoners, tuff quarries and curiosities worth knowing if you want to visit this island. The guide is divided in three sections: the story of Florio’s family and the tuna fishing period, the industrialization of mattanza and the bind between fishermen and religion and local folklore. Another section deals with the prisons of Favignana, the S.Caterina castle, and the S.Giacomo castle, and the modern jail. We also talk about the “casematte” from Second World War. The last section is dedicated to the nature of Favignana: the tufo quarries, the underwater life and the marine reserve, the beaches and the famous “cale”, like Bue Marino, Cala Azzurra, Cala Rossa, but also Cala Pozzo and Punta Sottile and many more stories and curiosities.